This is a translation of the speech given in Norwegian by Her Royal Highness The Crown Princess at Norwegian Literature Abroad's input and planning conference – Frankfurt 2019, Oslo April 2017. Liebe Deutsche Gäste, weil ich meine Rede auf Norwegish fortsetzen werde, möchte ich Ihnen dieses Zitat für die folgenden Minuten mitgeben. Woody Allen once said, "All literature is a footnote to Faust". What would England be without Shakespeare? What would Germany be without Goethe? What would Norway be without Ibsen? We could go on like this, country by country, around the world. Not to dwell on the old masters, but to illustrate how literature forges our identity. It helps to build nations. It helps to create our shared framework of references, our common heritage and our DNA – regardless of whether or not we know its origins. Literature helps to shape us – as individuals, as participants in society, as Norwegians, as Europeans and as citizens of the world. The treasure trove of literary works enriches people across the globe within their individual cultures. This is something fundamental we share, even if the literature itself and the reference framework it invokes differ from ours. So what happens when we take our literature over national boundaries and across the seas? It enables us to see each other. We can study the world through the eyes of others. Their view thus becomes our view, making us a little less foreign to one another. From this perspective, good literature may be more important today than ever before. Literature cannot be stopped at the border. It unites us, reminding us who we are and what our place is in the world. Literature also traverses the boundaries of time. We recognise ourselves in centuries-old texts -poems, psalms or plays that speak about light and darkness felt by people everywhere, in every era. The timeless is in a miraculous way also the most contemporary. It transcends all that is fleeting. That is why literature has – and should have – an element of the uncompromising. It should challenge the narrow-minded. It should take on that which goes against the grain of our essential humanity. It should shine a ribbon of light into the darkness – and offer a glimpse of something else, of something uplifting. History has many examples of the importance of art and culture for people in times of uncertainty, when their identity is under pressure. Literature unifies us, sustains us and strengthens us. It allows us to be part of something larger than ourselves, to walk alongside those who came before us and anticipate those who are to come. When our country set out to build its national identity at the beginning of the 1800s after many years under Danish rule, we turned to folklore to find our cultural heritage. In folk tales and the ancient sagas we found remnants of traditional Norwegian culture and we embraced these in our search for ourselves. As I said earlier, good literature is perhaps more important today than ever before. Because there is no doubt that freedom of expression is under threat. Here the Frankfurt Book Fair plays a key role as an arena for defending and spreading the free word – both as facts and as fiction. Frankfurt is possibly the world’s leading meeting place for open exchange of thoughts and ideas, solidified in the written word and communicated via books. People from around the globe come to the book fair out of respect for and love of the written word and literature. Germany has always been a very important country for Norwegian literature. We have a unique opportunity to strengthen and expand the cultural ties between our two countries. I am proud and pleased to serve as an ambassador for Norwegian literature in the process towards Frankfurt 2019. As we all know, Norwegian literature has won more space on international bookshelves in recent years. It gives me great pleasure to continue my longstanding commitment to literature and embark on this journey together with a unified Norwegian literature industry and other players from the cultural sphere. I would like to take the opportunity to thank all of you who have gathered here today for your work every day, year round, on behalf of Norwegian literature and culture. Your efforts help us to shape our national identity – and to tell the world what Norway is, who we are. I hope and believe that today’s conference will be an important first step to exploring the opportunities that Frankfurt 2019 will open up for Norway. I also hope and believe that along the way we will continue to search for the meaning of life in the literature we are looking to share. 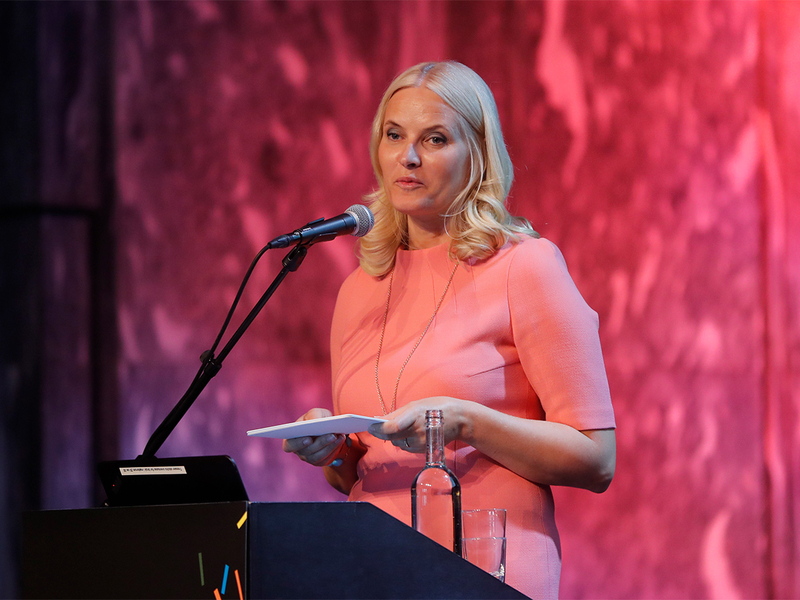 Crown Princess Mette-Marit speaking at NORLA's input and planning conference. Photo: Christian Lagaard, the Royal Court. The Frankfurt Book Fair is the world’s largest, most prestigious book fair. The fair takes place during a week in October. The first three days are reserved for trade visitors, after which the doors are opened to the public. The German literature market is the second largest in the world. Professionals from the publishing industry and the media in 125 countries gather at the fair to buy and sell rights. The fair attracts some 300 000 visitors each year. Some 10 000 journalists come from around the world to cover the event. Thanks to a collective effort on the part of a unified Norwegian literature industry, Norway has been selected to be the Guest of Honour at the 2019 Frankfurt Book Fair. The organisation Norwegian Literature Abroad (NORLA) is heading the Frankfurt 2019 initiative. One of the main objectives is to promote new literary voices. The Guest of Honour is the focus of considerable attention, not only at the book fair but throughout Germany. The Guest of Honour is given the opportunity to present itself at numerous events in Frankfurt in all fields of culture throughout the autumn. Held on 26 April 2017, NORLA’s Planning and Input Conference – Frankfurt 2019 marked the start of the effort to develop the message and content of Norway’s cultural programme. The aim is to showcase the very best in Norwegian literature and culture. Other Nordic countries have had the benefit of being Guests of Honour at the book fair as well. Finland held the title in 2014 and Iceland in 2011.